Coach Corey Neilson says Nottingham have the big-game mentality to win the Elite League play-offs after a two-year absence from the showpiece event. Nottingham, who finished fifth in the table and beat Cardiff to win the Challenge Cup in March, got past Belfast in the play-off quarter-finals. Panthers face Fife in Saturday's second semi-final, hosted in their home city. "We've proven that we can lift our level to the stage and this is a huge stage," Neilson said. "It's the hardest thing to win. It's four games and you get to a situation where everyone is playing desperate, everyone is putting body and hearts on the line. It's pretty special. "When the noise comes, be it good or bad, we seem to perform." Nottingham's National Ice Centre again hosts the four-game series, in which fans from across all 10 top-flight sides descend on the city for one weekend. While Nottingham fans continue to make up a majority of the crowd, the collection of support makes for a festival atmosphere. Neilson admits failing to get on the ice at an event hosted in their own city for the past two years was "horrible". 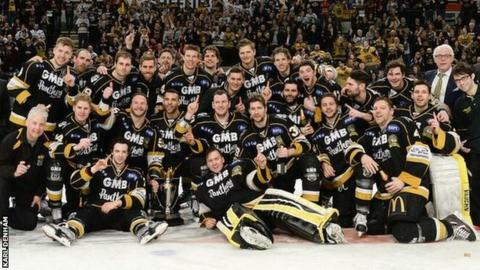 The Panthers had won the play-offs three years in a row before first missing out at the end of the 2013-14 season. "When the crowd gets rocking it will be pretty intense," Neilson told BBC Radio Nottingham. "It's an amazing event and I've touched on it with the players before the play-offs saying that this is something you want to be part of." The weekend's action at the National Ice Centre start with defending play-off champions Coventry Blaze facing Cardiff Devils.